Larry and Diane Herman: Is this our final stop? Who knows? We both grew up in Oak Park, Michigan (outside of Detroit) where we were high school sweethearts. We first met at a USY beach party about fifty years ago. We got married while still in college, almost 45 years ago. Last July we arrived in Los Angeles. But the journey that brought us here has been interesting and even adventurous. Larry: I studied economic development at the University of Michigan and had the opportunity to do my dissertation research in Africa. This was the first of our big adventures as Diane and I lived in Ouagadougou, Upper Volta (now Burkina Faso) for two years. While I was chasing cows and riding cattle trains to the Ivory Coast, Diane helped found the International School of Ouagadougou where she taught music and grade five. Ever since, Africa has been a big part of our lives. Diane: We returned to the States and spent four years in South Carolina where Larry taught at USC (the other one!) and I taught music in a rural community. We quickly became active members in the only Conservative shul in Columbia, Beth Shalom, where I also taught in the Hebrew School. Our oldest son Reuven was born there. Larry: In 1983 we moved back to the Midwest where I joined the faculty at Kenyon College in Gambier Ohio. As there was no Jewish chaplain, we became the leaders of Kenyon's small Jewish community. For more organized services we had to travel about 50 miles to Columbus. Our two other children, Shoshana and Aaron, were born in Ohio. Diane: As a family we continued to travel internationally, usually connected to Larry's work. First to Jamaica, then to France where we spent a year leading a college program, and eventually to Jerusalem where we spent a sabbatical year. Despite our Jewishly infused lives, this was our first visit to Israel. But life after that would never be the same! We joined the Masorti community of Moreshet Avraham in Talpiot Mizrach and eventually became Shabbat observant. After that year, it was no longer clear where home was. Larry: We returned to Ohio but moved to Columbus where we could live in a larger Jewish community and so that our children could attend a day school. I commuted to Kenyon while Diane taught at the Torah Academy where our kids went to school. Within two years, 1993, we decided to make aliyah. Actually, I only kind of made aliyah since I also took a job directing a research project in N'djamena Chad in Central Africa, commuting from Jerusalem. Diane: That was actually not so strange since lots of American Olim commute long distances to make it work financially. While Larry was back and forth, I retrained in a program for olim teachers and transitioned from being a music teacher to being an ESL English teacher. Larry: My first real job in Israel was teaching economics at the Academic College of Tel Aviv and Yafo. But I also retooled, becoming a transportation economist/planner and working at the Israel Institute for Transportation Planning and Research. Like most Israelis, I worked two and sometimes three jobs, including teaching at Hebrew University's Rothberg School. Since I had been consulting in Africa throughout my career, when the Institute decided to build their African business I was a logical choice to lead projects in Uganda and Mozambique. Diane: I also held multiple jobs, mainly teaching, both in schools and privately. The kids all went to different schools. We were very active in Moreshet Avraham (Larry was pushed into the presidency before he even learned to speak Hebrew well). We bought an apartment. Our eldest went into the Navy. The normal but crazy life for most Israelis. Larry: Following my project in in Mozambique in 2000 where I prepared the country's road strategy, the Mozambican Government asked me to return to advise on its implementation. In 2003 I took a leave of absence from my company for a two-year assignment. My two years turned into four. During that time I began to serve as the lay-leader of the small and unusual Jewish Community of Maputo. Diane: I stayed in Jerusalem with the kids who were in high school and doing military service. Larry would return to Jerusalem for Peach and Sukkot and we went to Mozambique each summer and winter. In between we spent a lot of time on Skype which had just been invented. 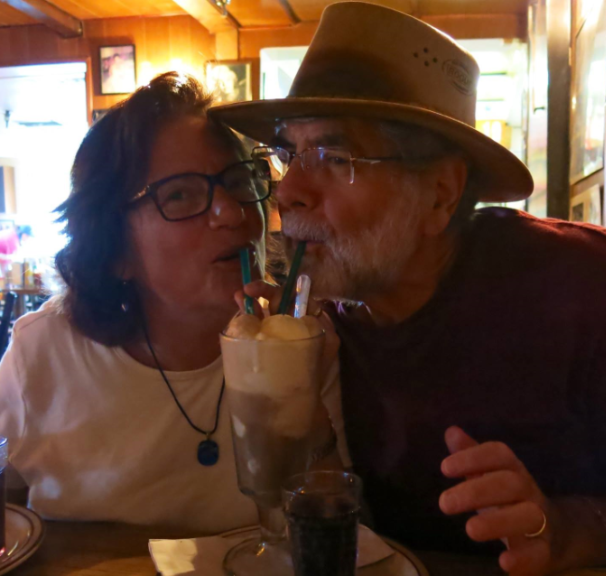 In 2007 I handed our apartment keys to Aaron and Shoshana (Reuven and his wife had moved to the US by this time) and flew the nest, joining Larry in Mozambique. Larry: Reluctantly. Diane was not too keen on living in Maputo. She had a one-year plan. That turned into a two-year plan when she got a great job running the ESL program at the American International School of Mozambique. Meanwhile, I continued to work for the Mozambican government and eventually formed my own consulting company with some colleagues. The Jewish community was growing during this time with Diane and me serving as the lay leadership. 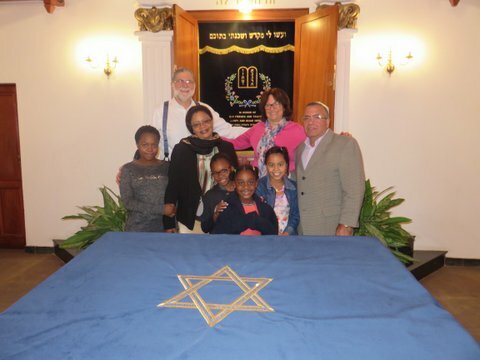 We reestablished the formal community as Honen Dalim -- Comunidade Judaica de Moçambique, restored the historic synagogue dating from 1926, celebrated a number of bar and bat mitzvas, a wedding, births, conversions, and welcomed the return of the community's Sefer Torah. Diane: And our 16th floor apartment overlooking the Indian Ocean became the address for Shabbat dinner for most every Jew passing through Maputo as well as the local community members. We also hosted the annual community Seder, crowding as many as 45 people into our living room. Nobody complained. Larry and I also prepared a Friday night "siddur" for the community in Hebrew, transliteration, Portuguese and English. Larry: Life in Mozambique was pleasant. We led the Maputo Wine Society. We loved to go on Safari in Kruger Park, Botswana and Zimbabwe, and to travel in South Africa. But we decided that it was time to leave Maputo and transition to semi-retirement. We had always planned to return to our home in Jerusalem. Diane: But our three children all had left Israel and returned to live in the U.S., two of them in Los Angeles. We had davened at the Library Minyan during one of our visits and found it a welcoming and comfortable place. So reluctantly we decided not to return home to Jerusalem, but rather to begin a new adventure in Los Angeles. Last July we arrived with our Chocolate Labrador Retriever, Tuli. Larry: Is this our final stop? Who knows? But we feel very much at home in Los Angeles, in the Pico-Robertson neighborhood, and at TBA. Life here is good.